The following analysis was done based on the timing derived by a Vedic Astrologer in Taiwan. 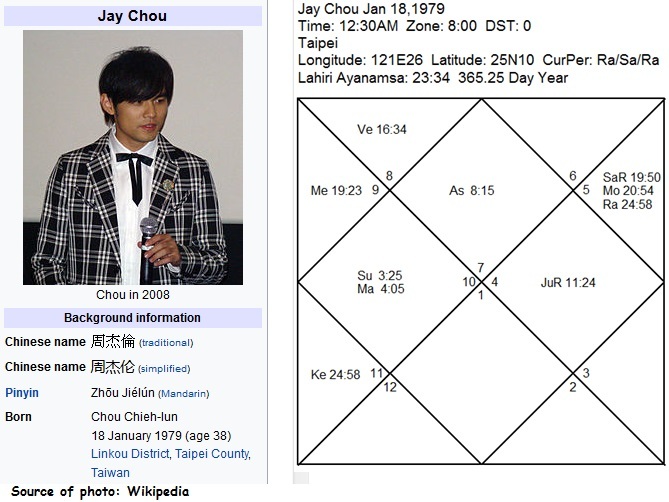 He have matched the major events in Jay’s life against the various possible birth time and found that it is most likely to be 12.30am. Here, I will read his chart based on my approach. This is actually an excellent chart we see here for 2 reasons. First is that you will notice that there are absolutely no planets badly placed in the 6th, 8th and 12th Houses at all. Next, we see that none of the planets are afflicted by the functional malefic planets other than Moon. 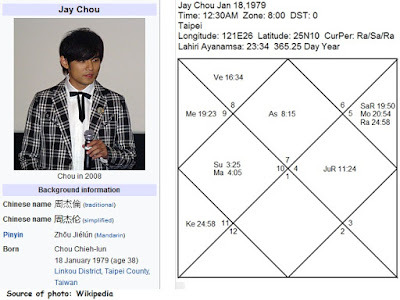 Since the Moon represents the mother, we know that Jay’s mother did not have a good life, especially the early years after she gave birth to him. Even after her son is now rich and famous, she will still keep herself busy with work because that is her nature. Self: The Ascendant Lord is Venus which is strong and well placed. Venus represents romance, luxury, show biz and most important in his case, singing. With Venus residing in his House of Status and Wealth (2nd House), it is no surprise that this will bring him success and money easily. The 2nd House is also associated with speech and voice, so it is easy to see the connection there with regards to his singing career. Marriage: Venus also represents the wife in a male’s chart and the 2nd House is also associated with marital bliss, so a strong Venus will give him the luck to get a wife who supports his family life. Mercury and Jupiter cast their influence on Venus, making the wife to be intelligent, soft-spoken and dutiful. Mars is the Lord of the 7th House (House of Marriage/Partnership) and it sits well in the 4th House. Its strength is compromised here as the Sun is combusting it but Mars remains strong since it is in its exaltation sign. In his chart, the 12th House, Virgo, is also associated with marital bliss, and its Lord, Mercury, is sitting well in the 3rd House unafflicted and strong. He is likely to get marry between Nov 2014 to Sep 2017. In actual fact, he was married in Jan 2015, which is the sub-period of Jupiter in the Rahu mahadasha period. Why this period? Rahu aspects his 7th House while Jupiter aspects Venus, the karaka for wife in a man’s chart. Career/Wealth: Sun, the lord of the 11th House (House of Gains), is well placed in the 4th House and close to the most effective point. Since the 4th House is connected with real estate, fixed assets and home, we know that his earnings is able to allow him to acquire properties with ease. The 10th Lord, Moon (career) is placed in the 11th House, meaning his career can make him a lot of money. The affliction of Rahu on Moon will give him a lot of mental and emotional tension as a trade-off but at the same time, Rahu also filled his mind with materialistic pursuits (always wanting more wealth). Jupiter, being the 3rd lord, represents creative talents towards communication (ability to compose). It resides in the 10th House of Career and closely aspects the 2nd House (House of Wealth and Status). Hence, his talents have a direct impact on his musical success. Children: He will have at least 1 but likely 3 children in his life. There will be a mixture of boys and girls. So far he has already 1 daughter and 1 son.